Brothers Scott Avellino and Don Avellino (left) in the distillery at Brandywine Branch Distillers, Elverson, Pa.
Don and Scott Avellino grew up in Avellino's, the family tire-and-auto business that their father, Don Sr., ran for decades. After Avellino's was sold, the brothers joined another company that sold auto parts. After buying a century-old stone barn in Elverson, Chester County, they got into distilling, running Brandywine Branch Distillers, whose small-batch specialties, under the Revivalist Spirits brand, are gins and bourbons. Also on site are a tasting room and bistro, whose menu from chef Natasha Yruel is designed to pair with the spirits. They sell to bars in the region as well as through the Pennsylvania LCB. As batches of the next gins macerated in the distillery, we sat up front in the bistro. I can understand why auto parts might not be an exciting line of work. Why spirits? Then we looked into the brewing world and saw that it was kind of overdone. At least I thought it was, and curious to know how we could be different or cut through that. Quickly thereafter, I saw an article in a New Jersey newspaper that talked about the very first distiller's license that was issued since Prohibition. In that article, it talked about how craft distilling is where craft brewing was 20 years ago and is expected to take the same trajectory. That was the a-ha moment. That's when we thought, 'OK. It's almost the same thing, but we can get into it while it's young, have a growth trajectory. It fits all the criteria that we wanted in a business.' We began pursuing it from there. Don: We love bourbon. Looking at the aging requirements to make a good bourbon, we thought, 'That really puts us years out.' How could we jump-start this and get it going earlier? We did two things. While we were putting the distillery together and finding a location and ordering equipment, we had our bourbon barrels custom-built for us by a cooperage that traditionally did Napa Valley wine barrels. They are a higher-grade barrel. They had never charred a barrel before but they did it for us. The barrels were about two times more expensive than a standard whiskey barrel, but we had an idea behind that. Then we hired a distiller to take our mash bill [mixture] and make the bourbon and put it into our barrels. Then we just socked it away. Distillery at Brandywine Branch Distillers, Elverson. Meanwhile, we were building the distillery, and gin is a product that you can turn around much faster. It doesn't have to be aged. That was the idea, to say, 'Well, while the bourbon is aging, we can still come out with a product that we want to make.' We chose gin because not only can we produce it faster, but we think it lends itself to the most creativity of any of the other spirits. Where whiskey is concerned, you can change the proportions of the grains or use some creative grains, but gin, once you get past juniper, the sky is the limit. We had all these ideas about ways that we could make gin different. We also saw that gin is trending. The way vodka took off, gin is at the very beginning of that curve, so we thought that was the right spirit to get into at the moment. We chose gin as the backbone of the company, and that Revivalist portfolio is our core portfolio. Now, our bourbons and ryes are beginning to come of age, so you're going to start to see more of those. How did you set up everything? Don: That took almost four years, with all the federal and state government red tape. Our stills were hand-forged in Stuttgart, Germany. They're called Christian Carl stills, and they take one year to build. In the meantime, we were out looking for a property. We had looked all over the place. We really wanted to be in places like downtown West Chester, where there was more population, but we couldn't find the right spot. Also, there were townships that were just petrified of the idea of a distillery in their township. 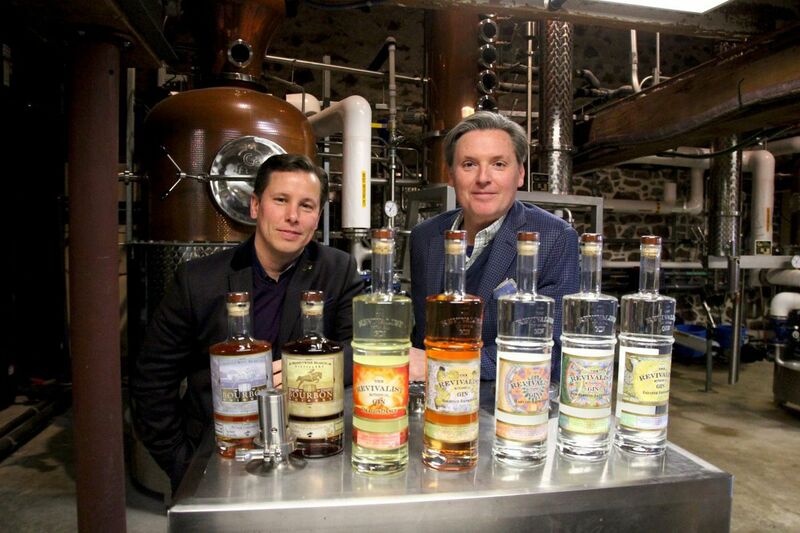 Gins and bourbons made by Brandywine Branch Distillers in Elverson. Long story short is we had been searching all over Chester County, found a property that we liked here in Warwick Township, went to the township, and they said, 'We have the perfect spot for you and we love the idea.' They introduced us to the owner of this current property, and my wife and I bought it. Then we began a restoration of the building. As the equipment began to arrive, the distillery was constructed inside the building. We turned the stills on January 2016. But you’d never actually distilled before? Scott: We had some help, with some industry professionals helping us kind of figure out the recipes. We wanted to make gins that really changed people's opinions on what gin is. Gin has had a very kind of up-and-down history and, a lot of times, people will say, 'Hey, I had a bad experience with gin,' or, 'I can't drink gin,' because they're used to that typical London dry that has that very juniper-forward flavor profile, that piney flavor. We knew that we wanted to make something different. Everything that we do, we try to add value and bring something to the table that you just can't get anywhere. What we decided on was to make a gin based off of every season. If you think about the botanicals that are harvested in spring, summer, fall, and winter, we've taken the primary botanicals that are harvested then and put them in a bottle. That became the flavor profile of each expression. Obviously, it has its own flavor profile, but it actually has its own personality. When you nose it, when you sip it, you get the essence of each of those different seasons. The fifth expression, Dragon Dance, is like the fifth season. It's vacation time. That is the only jalapeño-infused gin in the country. We actually infuse whole jalapeños in the gin. Basically, it gives it a very balanced flavor of that meaty, vegetably green flavor of the jalapeño, but it also gives it the heat. It really elevates a lot of different cocktails. People usually don't think of Bloody Marys with gin, but you put this jalapeño gin in that Bloody Mary and you get a little touch of the juniper, but then you get the nice balance of the jalapeño. It really elevates a Bloody Mary. How did you arrive at hours for the public? Don: We're open Thursday through Sunday. We would love to be open longer, but out here, we're more of a destination distillery. We tend to do a lot more business on the weekends. People make the drive to come out here in a beautiful countryside setting. Monday through Wednesday, it's quiet out here. You get a lot of commuters that run up and down Route 23, but not a lot of people are stopping to drink on a Monday, Tuesday, or Wednesday night. Is this a labor of love, or are you expecting to retire on this? Don: It's both. Our goal is to build a brand, an exciting brand. We want to be, first off, a very strong regional player. As a comparative, we look at Victory Brewing, Sly Fox, Yards, all those guys. We want to be that player in the spirits business. Brandywine Branch Distillers in Elverson, Pa.
Brandywine Branch Distillers in Elverson.